Can We Restore Thymus Function to Cheat Death? Dr. Greg Fahy wants to boost our flagging immune systems by rejuvenating our aging thymus and give us a new lease on life, warding off deadly cancer and infections. There is compelling logic behind Fahy’s idea. The thymus is an essential component of our immune systems. In fact, beginning in our 50’s, a collapsing thymus leads to all sorts of infectious diseases. For example, research suggests that decline caused by the aging immune system plays a stronger role in cancer than genetic mutations. Dr. Fahy has just announced preliminary results of a clinical trial which shows that restoring thymus function may be done safely and effectively. The thymus plays a crucial role in our immune system, and declining thymus function has been linked to chronic diseases such as cancer. Starting around the age of 1, our thymus begins to shrink and roughly halves in size every 16 years. Our immune systems weaken along with it. The thymus gland, which produces T cells, gradually loses function over time and becomes mostly inactive during adulthood, a normal process called thymic involution. Because of its essential role in our immune systems, some geroscientists regard rejuvenating the thymus as the ‘holy grail’ of preventing the immune decline of old age. In fact, restoring thymus function is such as prize that several organizations have been competing to be the first to do it. Dr. Fahy may have just grabbed the prize. Our immune system doesn’t just protect us against SARS, the West Nile virus and Aunt Minnie’s cold, it also plays a role in detecting and eradicating cancer cells before they have a chance to get out of hand. Moreover, an aging thymus leads to autoimmune disorders and chronic low-grade inflammation, referred to as inflammaging. A statistician once calculated that if we somehow had the immune system of a 12-year old, then, all other things being equal, we would live to 1000. Of course, all other things being equal is a mighty tall order. However, the claim has the math to support it. With the immune systems of a 12-year old, and conquering the other diseases of aging, the only things that would fell us are accidents and homicide. So, if you plan to live to 1000, or even 120 for that matter, you may want to add ‘restoring thymus function’ to your life extension checklist, because a healthy thymus is essential to a robust immune system, and the organ shrinks drastically by the time you reach middle age. Dr. Greg Fahy’s outfit, Intervene Immune is using human growth hormone (HGH) and DHEA to regrow the thymus. Fahy has just reported successful preliminary results of his clinical trial to rejuvenate the thymus. More details of the trial results are provided later on. Regrowing a thymus isn’t a trivial task. Dr. Greg Fahy is Vice President and Chief Scientific Officer at Twenty-First Century Medicine, as well as the founder of the biotech startup, Intervene Immune. 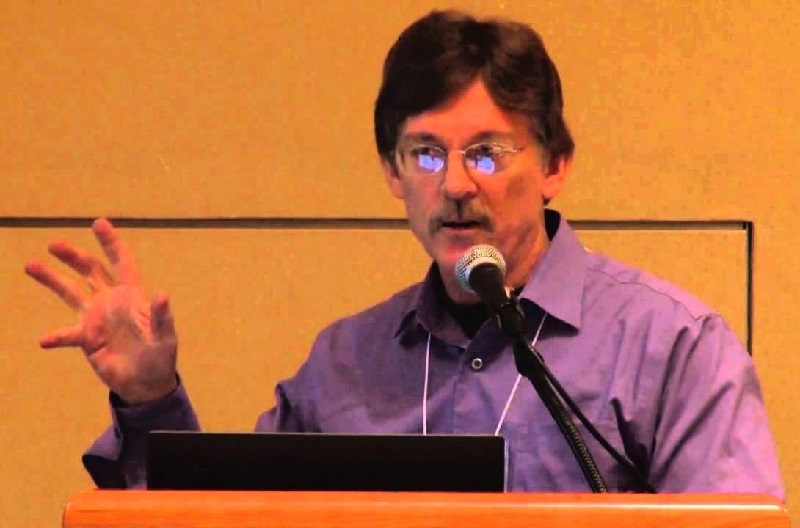 Before entering the field of thymus function restoration, Dr. Fahy had a long a distinguished career and developed many innovations in the unrelated field of cryonics. In fact, people who arrange to have their body frozen shortly after death -mostly a group of people called transhumanists – have Dr. Fahy to thank for improved cryopreservation technology. Dr. Fahy first tested the therapy on himself, successfully regrowing his own aging thymus, and has the MRI scans to prove it. Fahy claims his immune system has been bolstered as indicated by a rise in his levels of naive T cells, fresh immune system cells which are only produced in our early youth. Dr. Fahy used DHEA to head off potential side effects such as cancer and declining insulin function that are associated with HGH use. Currently, several other organizations are in a race to be the first to restore thymus function, including Aubrey de Grey’s SENS Research Foundation, the National Institutes of Health (NIH), and ThymiStem. The SENS Research Foundation is using a tissue engineering approach. Rather than simply restoring thymus function, the SENS plan uses stem cells to reseed tissue scaffolds to grow a new thymus. ThymiStem is an $8 million, a four-year project made up of nine international research teams focused on restoring thymus function via the FOXN1 gene. The project began in 2013 and plans to run to the end of this year. ThymiStem’s approach is to rejuvenate the thymus by upregulating the FOXN1 gene in the aged thymus cells of mice and growing a new thymus using transplanted, FOXN1-reprogrammed cells. Development and Maintenance of Thymic Epithelial Microenvironments. Link. Induction of Allogeneic Tolerance with Bioengineered Thymus Organoids. Link. Bioengineering Thymus Organoids to Restore Thymic Function and Induce Donor-Specific Immune Tolerance to Allografts. (Research study). Link. Scientists have restored thymus function by injecting the growth factor FGF7. Researchers have reported remarkable results after giving FGF7 to old mice, including increased cell proliferation and inhibiting a gene called Ink4a. This effect is important because deleting the Ink4a gene in mouse thymus cells leads to a significant delay in thymus shrinkage. On the downside, Ink4a is also a known tumor suppressor so inhibiting it may lead to cancer. Restoring thymus function may boost the immune systems of the middle-aged and older. Credit: Rawpixel. CC0. The thymus plays a central role in our immune system, the tiny organ lies just behind our breastbone and produces mature T-cells, the foot soldiers of our immune system. 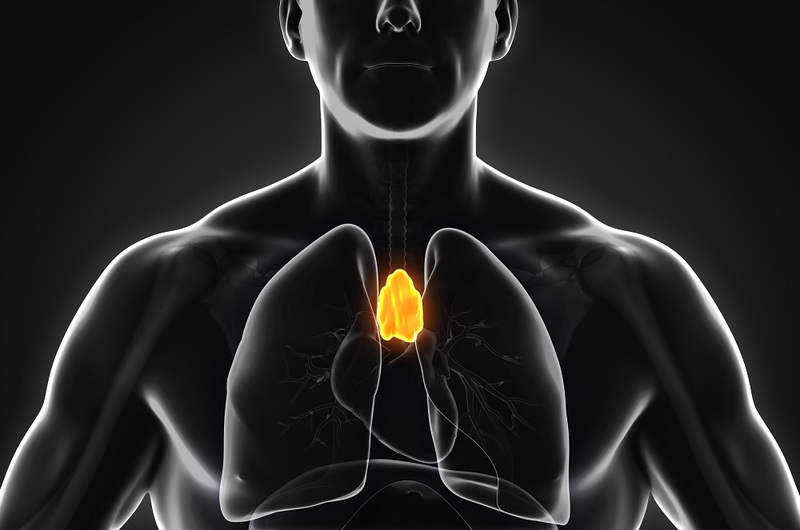 The thymus starts to shrink in puberty and can become non-functional by age 50 to 60. Nobody knows why the thymus shrinks, but it happens in all vertebrates, starting at puberty. Some scientists suggest that thymus shrinks on purpose to save energy because producing T-cells is very energy intensive. The thymus begins to shrink at puberty when the body begins to devote more energy to reproduction. As we grow older, many of our immune system functions weaken, and much of this is due to the decline in thymus function and the T-cells it produces. Our immune system has many jobs, the most important ones include 1) fighting infectious disease, 2) eradicating cancerous and pre-cancerous cells 3) cleaning out cellular debris and 4) keeping the body from attacking itself in autoimmune disorders that cause chronic inflammation. The age-linked decline in thymus function is one of the main reasons why we become increasingly vulnerable to cancer and infectious diseases. As we age, this increasing shortage of fresh T-cells leads to a decline in our immune systems. T-cells protect us against new infections – those we have not seen before – such as the West Nile virus or a new strain of flu. These pathogens are the most dangerous to senior adults. Researchers have shown that because of the decline in thymus function, our T-cell-based immunity begins to collapse in our 60’s, and is practically gone before the age of 80. This leads to the well-documented fact that more than 90% of seasonal flu deaths occurring in Americans over 65 years of age. The thymus produces only small numbers of new T-cells after puberty. While the thymus has already many T-cells before it shrinks, it is still a problem to maintain these cells for six to seven decades. Many T-cells disappear, and others become dysfunctional due to becoming senescent or being used up in battles with infections. Replacements are hard to come by as senior adults produce fewer new helper T-cells, and the few ones that our aging thymus produces are less effective than those it produced in our teens. Proper thymus function is critical for the development of the immune system of infants. It also plays an important role in adult immunity. However, adults can live without a thymus. New research shows that while adults can live without a thymus, removing the organ in early childhood accelerates the decline in immunity with aging. Bottom Line: The implication here is that restoring thymus function will boost our aging immune systems and guard against pneumonia and flu, life-threatening diseases to senior adults with immune systems weakened by age. Some speculate that rejuvenating thymus function might also help to prevent cancer. Cancer is a disease of out-of-control cell proliferation. Tumors often grow and spread because our declining immune systems fail to detect and destroy cancerous and pre-cancerous cells. Boosting the ability of the immune system to fight cancer – a novel treatment called immunotherapy – is one of the more promising forms of anticancer therapy. Younger people rarely get cancer, a phenomenon partially due to much stronger immune systems. Researchers speculate that our immune systems play a significant role in eradicating cancerous or pre-cancerous cells, and as our immune system declines, its ability to nip cancer in the bud declines with it. In fact, cancer doctors are hailing immunotherapy as the most effective way to treat tumors. While immunotherapy is complicated, at its heart, the approach involves stimulating the patient’s immune system to better fight cancer. The immune-boosting therapy is effectively a way of restoring the body’s natural immune balance. Bottom Line: The implication here, and a speculative one is that restoring thymus function will restore immune system function and guard against cancer. At the same time, our aging immune systems are growing underactive in some areas, they are becoming overactive in others. Our aging immune system becomes overly focused on attacking waste products that it cannot destroy. This along with the increase in the number of senescent cells leads to a chronic state of inflammation known as inflammaging, a term first coined by Claudio Franceschi in 2000, and later adopted by many leaders in the scientific community such as Judith Campisi. Moreover, Carlos Lopez-Otin also adopted the term in his landmark paper the Hallmarks of Aging, the most often quoted paper in the field of longevity research. During an interview last month with LEAFScience, Dr. Fahy reported preliminary success in a recent FDA-approved clinical trial using hormones to regrow the thymus. The researchers used a cocktail primarily consisting of Human Growth Hormone (HGH) that has been shown to restore thymus function in mice and AIDS patients. Dr. Fahy led the “Thymus Regeneration, Immunorestoration, and Insulin Mitigation Trial (TRIIM),” sponsored by Intervene Immune. The trial consisted of a 12-month treatment for nine men ranging from 50 to 65 years old. The men were divided into two groups, with the first group starting in late 2015 and the second ending in April of this year. The trial is a proof of concept. Fahy’s team aims to demonstrate if a cocktail of hormones can safely rejuvenate the thymus and restore its immune functions. Fahy’s team chose an age range in which most human immune systems start to collapse. Our immune systems are still viable around age 50 and tend to collapse by age 65. If Fahy’s team were successful, as preliminary results indicate, it would mean that restoring thymus function can prevent or reverse the early stages of immune collapse. When Dr. Fahy designed his clinical trial to regrow the thymus to bolster the immune system, he left no stone unturned. The team used MRI scans to evaluate the density of the thymus before and after treating the participants. Fahy’s team monitored many factors, including those related to general health and immune system function, such as T-cell population, lymphocyte telomere length and telomerase activity, and biological age based on an epigenetic clock. Earlier trials in mice show that growth hormones can regrow the thymus, such as growth hormone (GH) and Insulin Growth Factor 1 (IGF-1). In earlier experiments, scientists used these hormones to regrow the thymuses of old mice. The hormones have to be administered continuously, and when the researchers ceased the hormone treatment, the thymuses of the mice shrank. Administering human growth hormone (HGH) is controversial and has to be carefully monitored because some research indicates that it may cause side effects such as cancer if erroneously prescribed or improperly dosed. To avoid this side effect in the past, Dr. Fahy’s has used DHEA and a careful HGH dosing schedule. HGH is usually prescribed for children who lack it. The general view is that artificial supplementation with growth hormones in otherwise healthy adults is a bad idea because it delivers a hormone in unnatural ways causing levels of the hormone to spike in the body. However, scientists speculate that administering growth hormone releasing hormone (GHRH) is a more natural way of delivering GH, that it may eliminate the side effects of injecting growth hormone directly. Researchers have developed a low-cost way of delivering GHRH by using gene therapy to produce GH. While the treatment has proven successful in short-term animal trials, it has yet to be tested in humans. One click helps us spread the word – Share this post on social media and help us spread the word. It only takes one click on any of the social media links on this page. Tell us what you think about restoring thymus function – Please scroll down and enter your comments below. Cover photo: Nerthuz / Getty Images. Napolitano, Laura A. et al. “Growth Hormone Enhances Thymic Function in HIV-1–infected Adults.” The Journal of Clinical Investigation 118.3 (2008): 1085–1098. PMC. Web. 22 Nov. 2017. Link. Diagnosis, Treatment, and Advice: This article is intended for educational and informational purposes only and is not a substitute for qualified, professional medical advice. The information and opinions provided herein should not be used during any medical emergency or for the diagnosis or treatment of any medical condition. Therapies to restore thymus function are experimental. Experimental therapies to restore thymus function carry a much higher risk than FDA-approved ones. Consult a licensed and qualified physician for the diagnosis and treatment of any and all medical conditions. Call 911, or an equivalent emergency hotline number, for all medical emergencies. As well, consult a licensed, qualified physician before changing your diet, supplement or exercise programs. Photos, Endorsements, & External Links: This article is not intended to endorse organizations, companies, or their products. Links to external websites, mention or depiction of company names or brands, are intended for illustration only and do not constitute endorsements. Can These New Advancements in Cryonics Revive Our Bodies After Freezing? thank you for the link as I was unaware of that article. I share your optimism for this approach – very promising. As for the merits of rejuvenating the thymus, the proof in the pudding will come from the experimental data on the effects of regrowing the thymus. Dr. Fahy said the results were successful but didn’t give hard numbers. There is also another approach to rejuvenating the thymus. In postnatal life, FoxN1 is decreased with age. Age-related thymic involution has been demonstrated to be causally associated with decline of FoxN1. MiR-205 regulates FoxN1 levels in TECs probably by promoting the degradation of mRNAs whose products suppress FoxN1 expression. (http://www.jbc.org/content/291/44/23237). In addition to miR-205, miR-18b, miR-518b and miR-125a-5p.